Young age is opiate. Young persons are always delighted. With drinking wine, there will be double opiate. With passion, youth can do everything. But due to drinking alcohol, he will be very harmful for the society. So, it should be stopped at any cost. 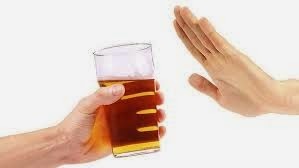 Following are the steps which will be helpful to stop alcohol drinking. 1. Every youth should be educated that to drink wine is very bad. If you will use it , you will die fastly. 2. Youth do not know what is in the alcohol. He drink it as soft drink. First he drink, then after opiate, drink will become his necessity. So, it is better not to drink before spreading its opiate germs. 3. Some youth drinks the alcohol for getting power. There is not any power in the alcohol. You will only lose your consciousness. It will decrease your power by defecting in your liver, lungs, heart and brain. So, never drink it. 4. It is the duty of teacher to tell the history of old bad drunken. All bad gays like sikander, gajni and others succeeded in the life after leaving wine. 5. Great saint says that Nam Khumari Nanka Chari Rahe Din Rat. It means, if you want to drink, drink of God name. In this opiate, you will enjoy every time without any harmful result. 6. First parent should leave this bad thing, after this their youth children will not drink. 7. There is big need of seminar in which youth should be alerted against drinking wine. Good youth should operate from from wine center for educating youth about the side-effects of wine. No Comment to " How to Stop Youth Drinking "